The glacial masses of the most recent ice age formed the Oder valley landscape, which is surrounded by high plains and ground moraines. 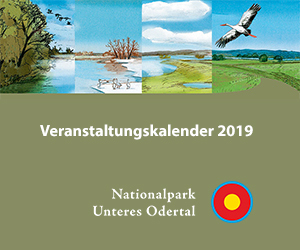 The Lower Oder Valley National Park is, in its geological form, the result of the most recent ice age, which ended about 12,000 years ago. The glaciers, which extended to the south of present-day Brandenburg, left behind the Uckermark hills, channels, lakes and shaped the valley, the Oder flatland. With its last great advance, the ice age covered the entire Lower Oder Valley, the push moraine stopped at Hohensaaten. Back then, the melting waters of the mighty glaciers still flowed westwards over the Thorn-Eberswald Glacial Valley. Only once the inland ice continued to retreat could the waters break through to the north, forming the present Oder. While the Oder Valley itself has only slight differences in relief, it is surrounded by the high plains of the ground moraines. They formed during a standstill phase of the glacier retreat, where the glaciers were able to deposit their massive amounts of sediment material. The valley floor is dominated by cover layers of sand and clay, streaked with peat especially in the north. Moors have also formed along the edges. The Oder flatlands were filled with melting and river water sediments, which flushed the glacier into the region, at about 50 metres to today’s level. During the ice age, the animal species typical of this period also lived in the Oder Valley. Mammoth, woolly rhino and giant deer died out however by the end of this period. The first inhabitants of the Oder Valley, who settled here in the Middle Ages, found a wild moor landscape with floodplain forests, and numerous tributaries that left behind the Oder, which during its floods repeatedly stepped over its banks and changed its course. The Lower Oder Valley is characterised by a broad spectrum of soil types, which can be distinguished from the bottom of the valleys, the sandy terraces and the moronic areas. The soils of the ground moraines are usually loamy to very sandy. They are distributed mosaic-like on the weak foothills to the wavy areas of the ground moraines. In the floors of the floodplains, fine-grained substrates have settled down, which were washed ashore by the river. This was made possible by the very low flow velocity of the river in the Oder Valley, which is caused by the menial gradient in the lower reaches of the Oder. High groundwater levels are typical for floodplain floors. These support the formation of lowland moors in the hollows outside the riverbed, so that the Lower Oder Valley is characterised here and there by very massive lowland moor peat beds. The valley sand terraces on the edge of the Lower Oder Valley are predominantly characterised by brown and rust-brown earths. The Vistula Ice Age, which left the Oder Valley largely in its present form, was the last cold period so far. It covered all of northern Europe with glaciers that extended into northern Central Europe. It started around 115,000 years ago and ended about 12,000 years ago. Thus, the northern continent was covered in ice for more than 100,000 years. Drastically decreasing average temperatures meant the end for thermophile woodlands 115,000 years ago, which helped shape the landscape back then. However, it was only about 60,000 years ago that the glaciers advanced to what is known today as northern Germany. Compared to earlier ice ages, the expansion of the ice was considerably lower. The maximum glacial advance ended on the line of today’s cities of Flensburg, Rendsburg, Hamburg, south of Schwerin, Brandenburg and Guben. It did not go beyond the Northeast German lowlands.